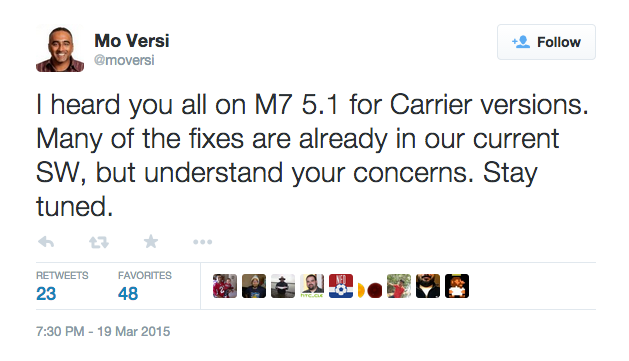 After news broke earlier this week that HTC had no intentions to update carrier variants of the One M7, but did plan to update the Google Play Edition of the device, One M7 owners took to the Interwebz to show their disappointment in the news. To us, “stay tuned” means HTC is looking into it, and if possible, they will attempt to bring Android 5.1 to all US carrier variants of the One M7. For owners, this is great news. However, it could be some time before anyone sees the update, if at all. As a consumer, I must commend HTC’s continued transparency with regard to updating devices. You don’t see this type of commitment to customers from other companies on social media, especially when it comes to Android updates.